Swami Vivekananda (January 12, 1863–July 4, 1902), born Narendranath Dutta was the chief disciple of the 19th century mystic Sri Ramakrishna Paramahamsa and the founder of Ramakrishna Math and Mission. He is considered a key figure in the introduction of Hindu philosophies of Vedanta and Yoga in Europe and America and is also credited with raising interfaith awareness, bringing Hinduism to the status of a world religion during the end of the 19th century. Vivekananda is considered to be a major force in the revival of Hinduism in modern India. He is perhaps best known for his inspiring speech beginning with “Sisters and Brothers of America”, through which he introduced Hinduism at the Parliament of the World’s Religions at Chicago in 1893. 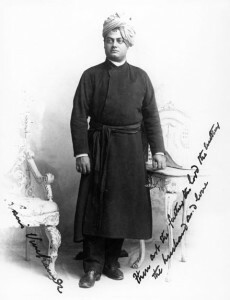 Swami Vivekananda was born in an aristocratic Bengali family of Calcutta in 1863. His parents influenced the Swami’s thinking—the father by his rational mind and the mother by her religious temperament. From his childhood, he showed inclination towards spirituality and God realization. While searching for a man who could directly demonstrate the reality of God, he came to Sir Ramakrishna and became his disciple. As a guru, Ramakrishna taught him Advaita Vedanta and that all religions are true, and service to man was the most effective worship of God. After the death of his Guru, Vivekananda became a wandering monk, touring the Indian subcontinent and getting a first-hand knowledge of India’s condition. He later sailed to Chicago and represented India as a delegate in the 1893 Parliament of World Religions. An eloquent speaker, Vivekananda was invited to several forums in the United States and spoke at universities and clubs. He conducted hundreds of public and private lectures and classes, disseminating Vedanta and Yoga in America, England and a few other countries in Europe. He also established the Vedanta societies in America and England. Later he sailed back to India and in 1897 founded the Ramakrishna Math and Ramakrishna Mission, a philanthropic and spiritual organization. Swami Vivekananda’s inspiring personality was well known both in India and in America during the last decade of the nineteenth century and the first decade of the twentieth. The unknown monk of India suddenly leapt into fame at the Parliament of Religions held in Chicago in 1893, at which he represented Hinduism. His vast knowledge of Eastern and Western culture as well as his deep spiritual insight, fervid eloquence, brilliant conversation, broad human sympathy, colourful personality, and handsome figure made an irresistible appeal to the many types of Americans who came in contact with him. People who saw or heard Vivekananda even once still cherish his memory after a lapse of more than half a century. In America Vivekananda’s mission was the interpretation of India’s spiritual culture, especially in its Vedantic setting. He also tried to enrich the religious consciousness of the Americans through the rational and humanistic teachings of the Vedanta philosophy. In America he became India’s spiritual ambassador and pleaded eloquently for better understanding between India and the New World in order to create a healthy synthesis of East and West, of religion and science. In his own motherland Vivekananda is regarded as the patriot saint of modern India and an inspirer of her dormant national consciousness, To the Hindus he preached the ideal of a strength-giving and man-making religion. Service to man as the visible manifestation of the Godhead was the special form of worship he advocated for the Indians, devoted as they were to the rituals and myths of their ancient faith. Many political leaders of India have publicly acknowledged their indebtedness to Swami Vivekananda. The Swami’s mission was both national and international. A lover of mankind, he strove to promote peace and human brotherhood on the spiritual foundation of the Vedantic Oneness of existence. A mystic of the highest order, Vivekananda had a direct and intuitive experience of Reality. He derived his ideas from that unfailing source of wisdom and often presented them in the soulstirring language of poetry. The natural tendency of Vivekananda’s mind, like that of his Master, Ramakrishna, was to soar above the world and forget itself in contemplation of the Absolute. But another part of his personality bled at the sight of human suffering in East and West alike. It might appear that his mind seldom found a point of rest in its oscillation between contemplation of God and service to man. Be that as it may, he chose, in obedience to a higher call, service to man as his mission on earth; and this choice has endeared him to people in the West, Americans in particular. In the course of a short life of thirty-nine years (1863-1902), of which only ten were devoted to public activities-and those, too, in the midst of acute physical suffering-he left for posterity his four classics: Jnana-Yoga, Bhakti-Yoga, Karma-Yoga, and Raja-Yoga, all of which are outstanding treatises on Hindu philosophy. In addition, he delivered innumerable lectures, wrote inspired letters in his own hand to his many friends and disciples, composed numerous poems, and acted as spiritual guide to the many seekers, who came to him for instruction. He also organized the Ramakrishna Order of monks, which is the most outstanding religious organization of modern India. It is devoted to the propagation of the Hindu spiritual culture not only in the Swami’s native land, but also in America and in other parts of the world.